Facebook is one of the most popular social media to communicate and share thoughts with other Facebook users around the Globe. Along with these features, it can also be being used for other social media marketing activities to promote their business. For this people are usually used the Facebook Search feature to explore new persons, groups, and pages. This activity is not only specific to business but can also be being used for the common Facebook users to search friends and remote persons. So whenever we type any keyword to search any person in the Facebook Search bar, it will give different options matching our requirement. In this, way Facebook system will automatically store all Search activities at a place in the form of Facebook Search History. One can access this search history any time to see his all activities right from his joining to Facebook. These searches are good to see the common queries made by you. Hide Facebook Friends List from everyone and only visible to you. Just like Google and other search engines, Facebook has also refined its search. So that Facebook users can search queries in a natural way. Although it is good to keep these searches appear, somehow if you don’t want to see them then this article is for you. It is very easy to delete all Facebook search history from the computer and smartphone at once. 1: Login to Facebook and click on the Facebook Search bar. 2: Click on the Edit option in the top right corner of the Facebook Search bar. 3: On your Facebook Search History page, you have the option to either delete your search query one by one or delete them at Once. 4: To delete a search query individually, click the Edit button next to Lock. Click Delete. 5: A dialog box will appear to confirm the delete, Click Remove Search. 6: To delete all Facebook Search History at Once, Look for Clear Searches option at the top of the page. It is worth mentioning that Once you delete any search history, you will not be able to retrieve them again, Neither in search history nor in the search bar. 1: Go to the Facebook App on your smartphone. 2: Click on the three horizontal Lines at the top right corner. 3: Scroll down to find Activity Log, tap to open it. 4: Tap Filter on the activity log Screen. 5: Scroll down the list and look for Search History, Tap Search History. 6: You will find the Facebook Search History Screen. 7: To remove any search query, just Click on the Cross Button and Tap Remove to confirm delete. 8: To delete Facebook Search History in a single click, just Tap Clear Searches and Tap Confirm to delete. 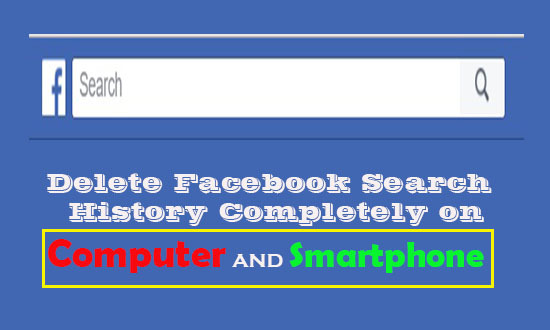 So in this way you can clear Facebook Search History from Computer and Android Phone permanently. Do comments with your feedback. Thank you for a nice tip.